Commercial Auto Insurance is a vital part of any mobile business’s operations. At Insurance Town & Country, we get to know the needs of your small business and find a customized Commercial Auto Insurance plan that makes sense and saves you money. When creating a custom policy for your commercial automobile or automobiles, there are several coverage options. Each of the following coverages, among others, are available, Bodily Injury Liability, Property Damage Liability, Medical Payments, Comprehensive Coverage, Collision Coverage, GAP Coverage, Uninsured and Underinsured Motorist Bodily Injury Coverage, and Bailee Coverage. Your business may require a more specific policy addition not listed above. We encourage anyone reviewing their Commercial Auto Insurance policy to contact us and ask questions about their coverage and coverage opportunities, because changes in your business model, recent business growth or reduction, and location/distribution may affect the type of policy or policy additions that you need. It is our job to make sure that you know how to thoroughly protect your business in the case of an incident. 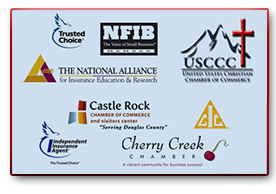 So, give us a call at 303-388-7216 or shoot us an email at contact@insurancedenver.net so that we can review your policy together, answer any questions you may have, provide you with an accurate quote for your company, and help you made a smart insurance decision. While a great product for many companies, Business Owners Policies are not optimal or available for every business. If your company does not currently have a BOP, or you suspect that you may be paying too much for Business Insurance, let our Insurance Specialists put your mind at ease. Give us a call at 303-388-7216 or shoot us an email at contact@insurancedenver.net so that we provide you with an accurate quote for your company’s specific needs.